The use of red and white as the national colours come from 1831, coming as they do from both the arms of Lithuania, and of Poland, during the Polish-Lithuanian Federation. Both feature a white image on a red shield. Poland has a white eagle, and Lithuania has a man riding a horse. The colours themselves herald from the 1830 uprising in Poland against Russian rule, with to revolutionary forces wearing red and white. However, the colours where not adopted in totality. The liberal communities, still enamoured by the French Revolution, used red, white and blue. The white and red bi-colour flag finally emerged in 1916, however, some people would fly it white on red, and others, red on white. The Polish forces recommended to people to fly the flag white on red, and in 1919, with Poland gaining its independence from Russia, flew the white on red bicolour as the new national flag of Poland. However, at sea, the Polish flag was the same as the flag used by harbour pilots and tugboats, so Poland launched its naval ensign, with the coat of arms placed in the centre of the top white stripe. 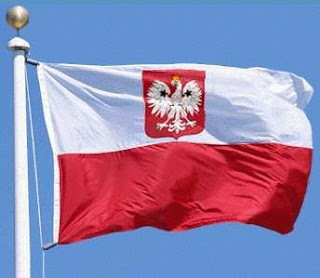 This flag has since become the state flag of Poland. The Polish flag has not seen much altering, with the shade of red being altered, only. The state flag has also seen relatively minor changes, with the style of eagle going from classicist to baroque in 1927, and with the creation of the Communist Peoples Republic, the crown was removed from the head of the eagle. It has since been returned!